One of country music’s hottest acts is coming to the Mandalay Events Center. 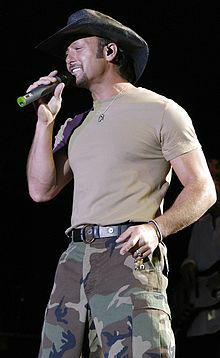 Tim McGraw has been a force to be reckoned with since the ’90s and has continued to dominate the country chart’s top 10. He and his wife, Faith Hill, finished their Soul2Soul tour in 2007, and now he’s back on a solo tour accompanied by Jason Aldean and Halfway to Hazard. In 2007, Tim McGraw was accompanied by wife Faith Hill and completed “Soul2Soul II”, the most successful consecutive multi-year tours in country music history. Now, the popular headliner and country music icon returns to touring as a solo act and will bring the “Tim McGraw ‘08 Live Your Voice Tour” to the Mandalay Bay Events Center.